"I use French chocolate with a 70% cocoa content. Serves four people, or one greedy one! 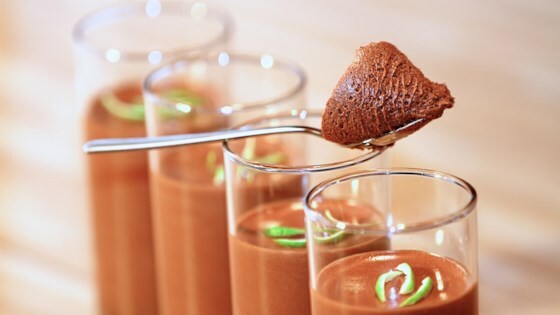 Chill for a couple of hours, and use the firmed mousse to make chocolate truffles. Heavenly. " Chop chocolate and place in top of a double boiler, or in a microwave-safe bowl, microwave chocolate until melted. Stir occasionally until chocolate is smooth. Allow to cool slightly. Whip cream in large bowl with electric mixer until soft peaks barely form. Fold chocolate into cream and spoon into serving dishes. Chill 30 minutes in refrigerator, until set. Easy to do, but not the best result ever. Definitely only refrigerate for about 30 minutes prior to serving - otherwise you end up with a block of dark chocolate. This was delicious, but it was difficult to get the right consistancy. If it is chilled to long it is very thick and not long enough it is too light. Still lovely.